During our European summer travels while Margaret lived in the Czech Republic we stopped in Florence, Italy for a day to explore and see the sites. 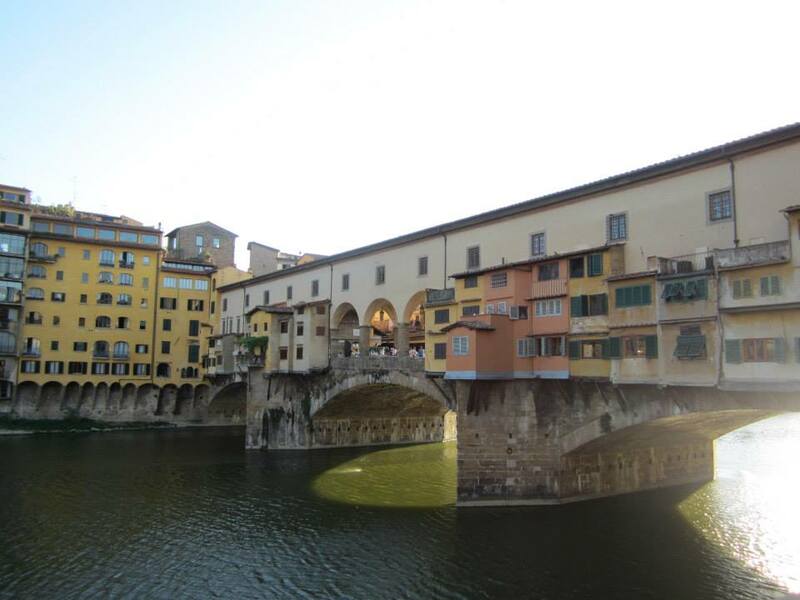 Our time in Florence was limited, so we researched Florence beforehand. While researching we make a list of attractions that are essential for us to visit/encounter and then search for free attractions or days that certain attractions are discounted or even possibly free, such as scenic views, piazza’s, and local snacks (in this case gelato). Finally, we have a list of possible places that we would love to visit if we have additional time, although we rarely get to that list-guess we just have to return? One of the best places to visit while in not only Italy, but large portions of Europe are the churches that are donned with beautiful art work, designs, and architecture. 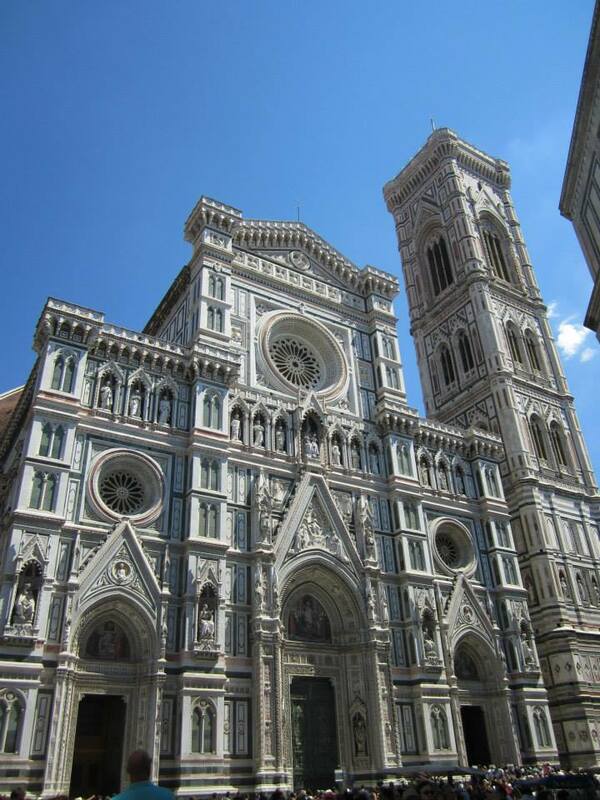 Florence is home to the Duomo, Santa Maria Del Fiore Cathedral, which is massive in size and beauty. The outside of the church is decorated in the black and white typical of churches in Italy and the inside is incredible with the massive transepts. The line outside the Duomo can be rather long so plan ahead. Also it is common for churches to have restrictions of dress code-so, again, research beforehand, because it would be a waste of time to stand in line, simply to be turned away and miss the beautiful architecture inside. Every day we were in Italy we packed in our day pack not only snacks and water, but additional lightweight clothing that we could quickly throw on before entering a church to ensure we didn’t miss out. While in Italy we often roamed about just looking at the architecture and wandering into churches to see the ornate structures and art. Europe is full of amazing sites, simply by wandering around. In Florence another interesting site is the Ponte Vecchio, which is a bridge lined with shops along the way that protrude from the bridge. The bridge is unique, making for amazing views and if you want to grab a little something along the way. A short walk away and a slight hike up from the Ponte Vecchio is Piazzale Michelangelo that has incredible views of the entire city. Side Note: While in Italy, we were on a tight budget and we discovered that sandwiches, pizza, pasta, and please don’t judge us, but McDonalds were the cheapest options. Sandwiches are always a basic option for the thrifty traveler. Pizza and pasta were filling, “authentically Italian,” and always delicious. As for the McDonalds, for those who have traveled to Europe and been inside a McDonalds, you will probably have experienced that the inside is quite unlike McDonalds in the States. In Europe, McDonalds are often much nicer, provide a more diverse menu, and offer a large cafe section, filled with cakes and pastries. The reason we frequented McDonalds was they offered amazing coupons that provided us with cheap options, that offered very different options than you would find in the US. So for those traveler’s like us who want to see and explore as much as possible and remain on the go there are cheaper food options. The money we saved is what allowed us to go on a day trip to Pisa. Even for those who are budget traveling, try to make sure and always try the local cuisine, because food is a part of culture! Every time we travel, we make sure to indulge at least a couple times in a nice restaurant, serving food typical from the area and have often found that will be some of the best adventures of the trip.